The Theatre Royal in New Street, Birmingham, was first built in 1773-7 and opened as The New Theatre. The premises was extended in 1777 and in 1780 a sophisticated classical portico front was commissioned by James Wyatt. 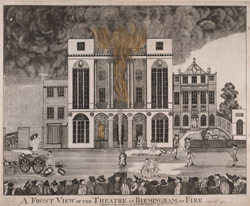 At two o'clock in the morning of 18 January 1792, the theatre was set on fire, probably by townsfolk who opposed the theatre. Several rooms of the theatre were gutted, although the stone portico survived. The culprits were never found. After the fire, the theatre was restored and extended, reopening in June 1794.